How to arrange a large bathroom? You can go crazy when arranging a large bathroom – but there must be a method to this madness. Remember that a bathroom is part of a larger whole – an apartment or a house – so its style should be consistent with this. A large space is a big obligation. You cannot allow to be overloaded it with equipment, colours and decorations, so as not to create an effect of overwhelmingness. The space is supposed to serve man, not the other way around – you have to be able to find yourself in this space, not lose yourself in it. 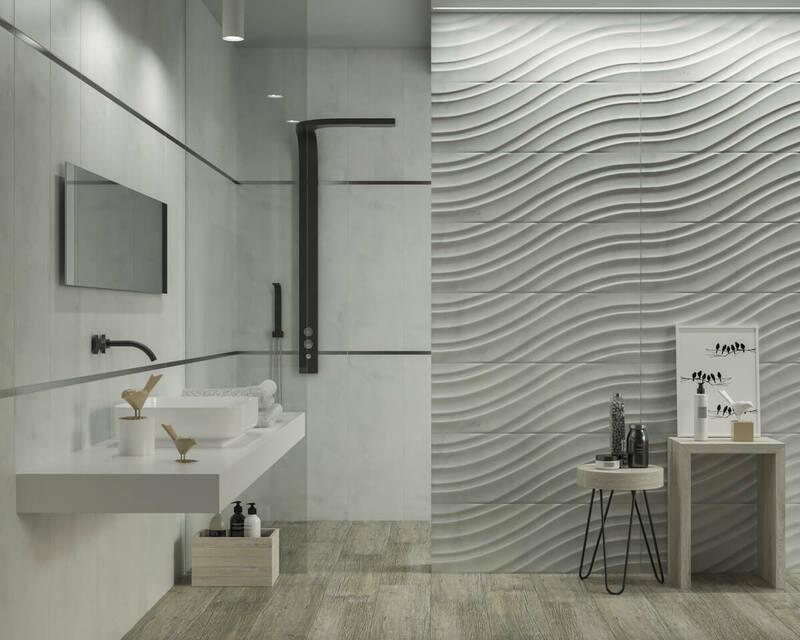 Luckily, the trend of “small walls” – that is a hard (in the literal sense) division of the functional zones in the bathroom, came to an end. The current interior design tendencies express the desire to maximise the space consistency, eliminate clear divisions and lose any form of excess. The space should have a positive effect on a person and be in harmony with their rhythm of life. The optimum use of natural light is important – and in the case of an absence of windows in the bathroom – taking care of lighting, the arrangement of the equipment, harmonious composition and colours that “will not seize” the area; on the contrary – this will optically enhance its impressive size. There are some tips and arrangements below for large bathrooms in line with the latest trends. When having a large bathroom space, you do not have to choose between a bathtub and a shower or fight about who should brush their teeth first. You can have both – a bathtub (even a free-standing one!) and a shower. You can install two wash basins to ease the morning traffic. You also have space for a useful bidet. And for leisure – for example for reading (in the bath or on the seat), in the good and atmospheric light of a lamp. 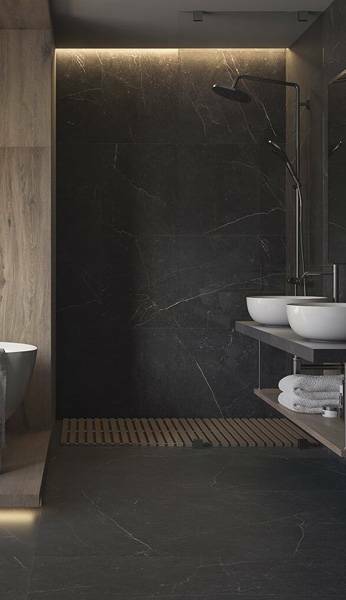 Lots of very light, large format tiles with glossy surfaces enhance the impression of reflecting the light, bringing out the advantages of a spacious interior. Doblo tiles collection, Ceramika Paradyż. Simple, minimalistic wash basins arranged symmetrically on a wooden table, look light and are simply comfortable – just like a large horizontal mirror in a frame made of light wood. A free-standing bathtub, encased in dark graphite tiles, harmoniously refers to the dark wall on the other side. The only decorative function can be seen in the contrast between light and dark surfaces, as well as the diversity of matt and glossy surfaces on a dark wall. Doblo tiles collection, Ceramika Paradyż. One of the current arrangement tendencies is using a narrow colour palette. 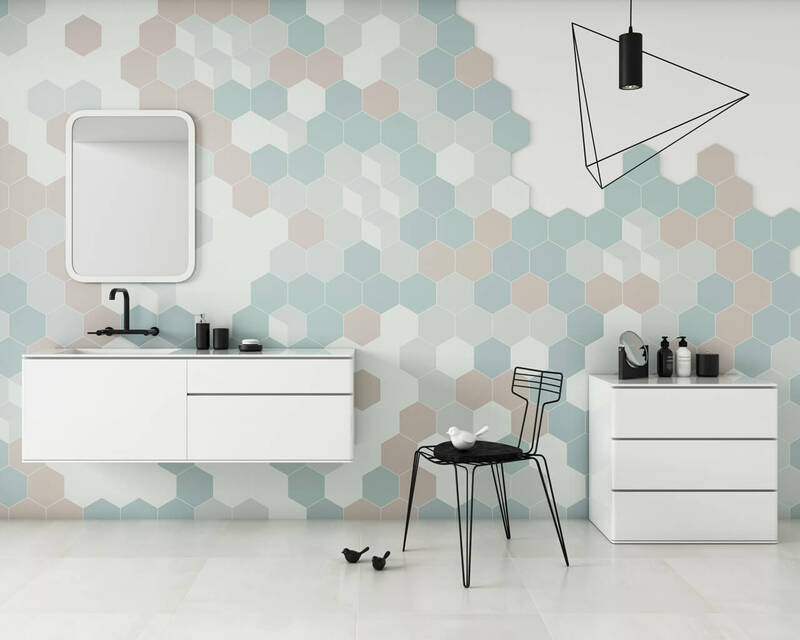 Colour minimalism is compensated by interesting design effects, such as graphics on a background made of base tiles or mesmerising, intriguing structures, or varied surfaces: matte, glossy, semi-polished and structural. This way you can clearly separate individual spaces in the bathroom, avoiding colour and pattern overload. 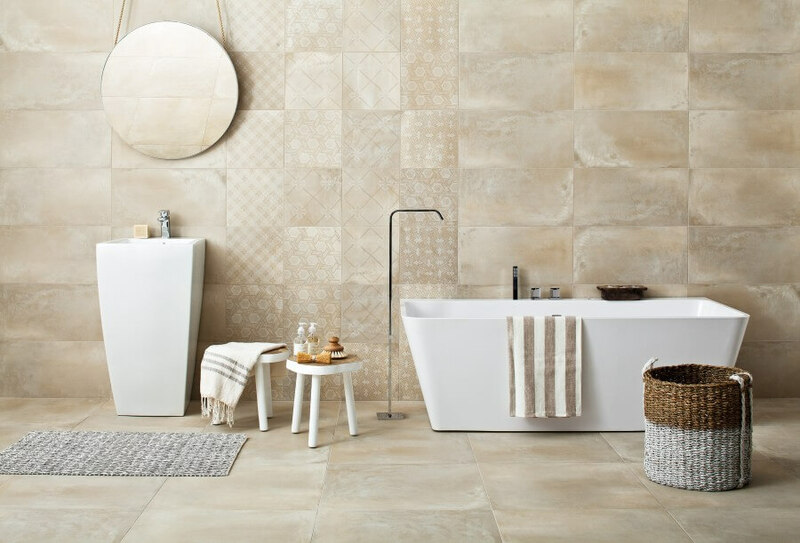 Sandy beige and the unique look of each tile are a harsh yet at the same time extremely elegant base for the decor of a modern, large bathroom. Tigua tiles collection, Ceramika Paradyż. Ethnic, geometric decorations placed on a beige background do not “scream”, but very eloquently signal the exclusive character of space. The same goes for the original look of wash basins and free-standing bathtub. Wicker and wooden accessories add to the cosy nature of the bathroom. 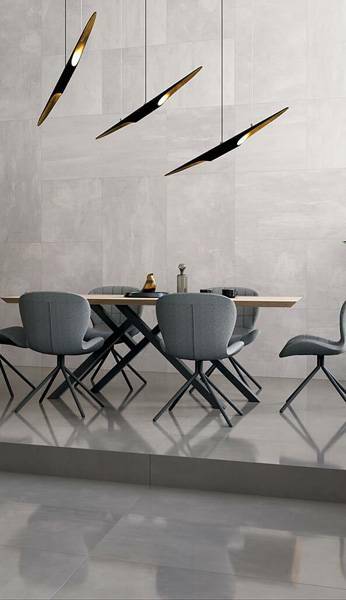 Cold autumn grey, ceramic “wood” on the floor and mesmerising, wavy structure of large format tiles. Stone City tiles collection, Ceramika Paradyż. Everything is in a coherent, calm colour scheme – it is the basis for a modern bathroom arrangement. Dark decorative strips optically enlarge the space and harmoniously refer to the black elements of equipment – fittings or stool legs. A minimalistic hanging table with a washbasin adds lightness to the whole arrangement. 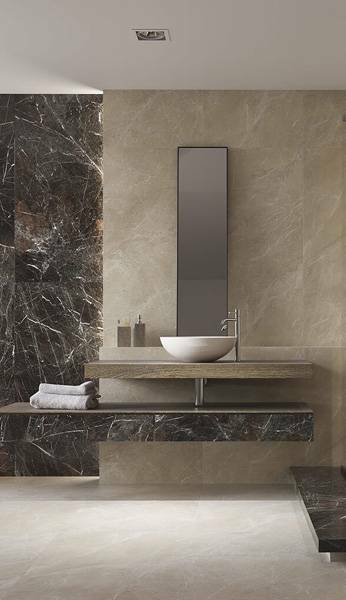 The huge mirror in the alcove gives extra space and minimises the effect of space division. Stone City tiles collection, Ceramika Paradyż. Structural geometric fun in a large bathroom is based on a trick of the light – both natural, from large windows, as well as from artificial. 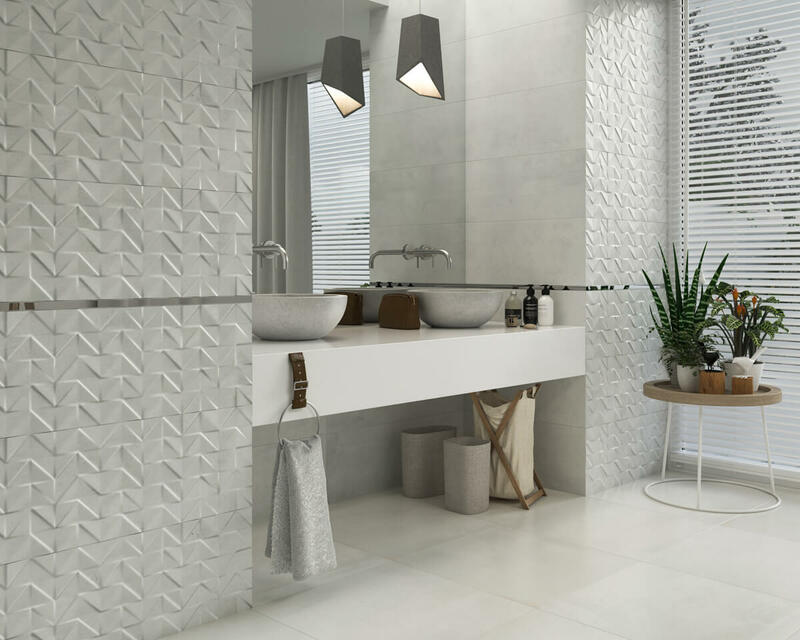 Three-dimensional triangles on the tiles make the seemingly calm, arranged in neutral light-ash-grey colours bathroom gain a strong character. The contrast between the distinct structure of the walls and the smooth surface of the floor enhances this effect. 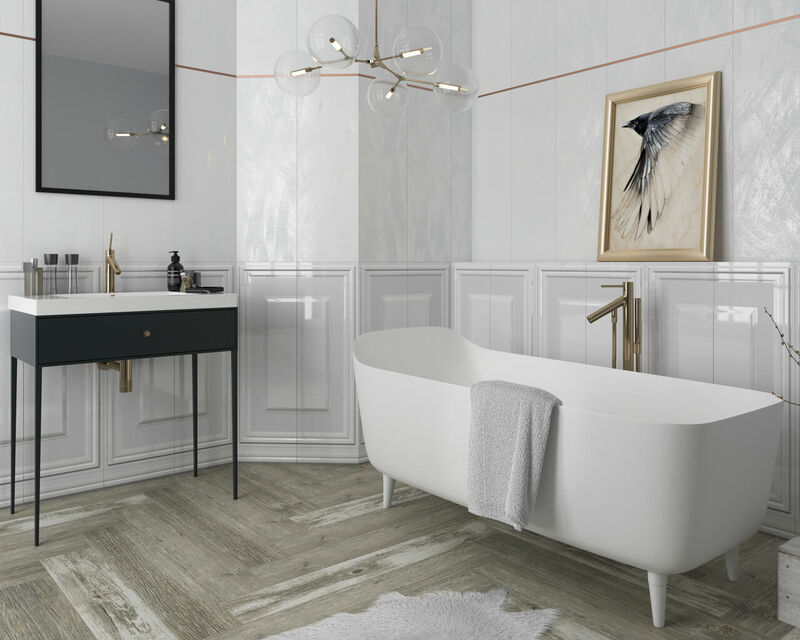 Contemporary spacious bathrooms sometimes do not look like bathrooms at all – they look like comfortable living rooms, often with furniture typical for the living room: chests of drawers, armchairs or chairs. This approach to bathroom design is becoming more and more popular – a large space becomes not only a typical bathing place, but also a place for rest, for putting on make-up, or even for a dressing room. This solution has many advantages – many interconnected activities can be done in one place, but in order to use it, you need a really large space, arranged in the right way. Two types of chests of drawers. One contains a washbasin, visible only after closer inspection. The black chair in a very original form emphasises the modern character of the bathroom interior. The small hexagonal ceramic tiles form a unique composition. The light floor made of large, semi-polished tiles enhances every design element of the bathroom, which at first glance does not resemble it. Esagon tiles collection, Ceramika Paradyż. Shower alcove without any cover – again a privilege of large bathrooms only. You do not need to worry about splashed water, and the space is not limited by the shower cubicle (which also has its own requirements for keeping it clean). A large space encourages using it to the maximum. However, for the sake of clarity, calmness and lightness of the arrangement, it is worth to maintain moderation. Keep the things there that you only find necessary, and that fit the style and design of the large bathroom. Should it be used for bathing only? Some plants should be enough as a decoration. Should it also be a place of rest and relaxation? Instead of a recliner, footstool and three chairs, use one armchair – it should be enough. Consistency and moderation in the use of contrast as the main decoration and aesthetic medium make the bathroom look very elegant. Rino tiles collection, Ceramika Paradyż. 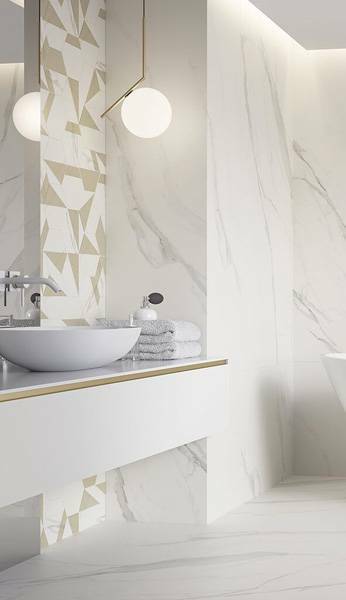 Trendy whites and greys can be enriched with a distinct colour accent – this will give our bathroom a unique, expressive character. You do not have to necessarily buy matching fittings or use this colour to paint the walls. Delicate decorations will be enough – towels, vases, plants, sculptures. If you get bored of this colour, you can always easily change it 😊 Colour has a magical power – it enhances each of the neighbouring colours. Distinct colours enliven a large bathroom, and the radiant colours of decorations bring the element of dynamics to the orderly interior. The distinct colour of decorations does not have to be the main decorative element, but an accent that emphasizes delicate base colours. Yoshioka-Purio tiles collection, Ceramika Paradyż. The bathroom does not always have to be subdued, calm and delicate. It has to be tailored to your needs and reflect your style. Do you like minimalism and modernity? Express it in your bathroom. Or maybe on the contrary? You like glamorous interiors (you can read more about arranging bathrooms in this style here) or the shabby chic style? 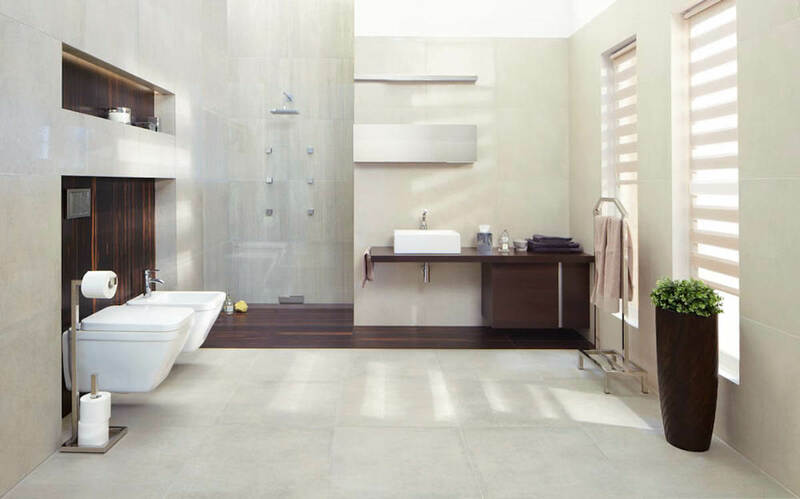 Give the bathroom your style and character – from fine details to properly arranged walls and floors. More importantly, the bathroom should be a place where you feel good. Adjust it to your style – it is a recipe for success! Chevron tiles collection, Ceramika Paradyż. Stylistic coherence with the rest of the house or apartment – it will make the space you live the one where you find peace and tranquillity. 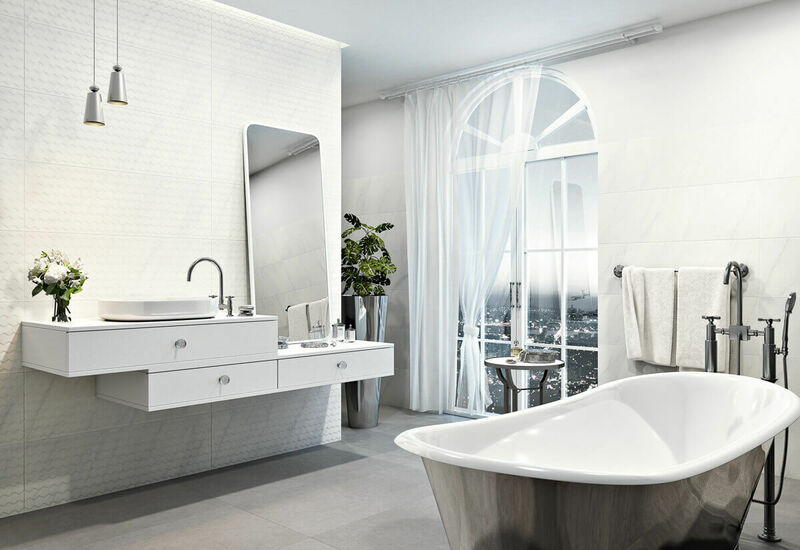 Compatibility with your style – all of the above tips will be of value only when the bathroom is decorated and arranged according to your style, needs and preferences. You can always find more inspirations and tips on our webpage www.paradyz.com.